The item below has recently turned up on Facebook, thanks to someone who I thought was a friend of mine!? THE HUNTERS WERE LAST YEAR'S DEVON COUNTY CHAMPIONS SO I THOUGHT I'D TAKE A LOOK BACK TO THE LAST TIME WE WON THE COMPETITION IN 2001. IT WAS THE YEAR OF THE 'FOOT & MOUTH' CRISIS SO IT WAS ONLY BY LUCK THAT THE COMPETITION, HELD IN TOTNES, TOOK PLACE ATALL. SEVERAL LEAGUES WERE NOT COMPLETED THAT SEASON & WE WERE ONE OF THEM. THE FACT THAT NONE OF OUR CUP COMPETITIONS FINISHED EITHER MEANT WE HAD TO COME UP WITH A WAY OF FINDING A TEAM TO REPRESENT US. WE DECIDED TO ASK THE EIGHT 1/4 FINALISTS IN THE COUNTY CUP TO PROVIDE ONE PLAYER EACH TO FORM THE TEAM OF EIGHT. THEY WERE GEOFF HUXTABLE OF LANGTREE B, BRIAN DANIEL OF WALLABIES, KENNY MAY OF PUSHOVERS, TOMMY METHERELL OF BUCKLAND BREWER B, ANDREW BRAUNTON OF MASHERS, ANDREW'S BROTHER IAN OF THE HUNTERS & MALCOLM SKINNER OF FASTUNS. THE EIGHTH TEAM FAILED TO PROVIDE A PLAYER SO I VOLUNTEERED TO BE THE EIGHTH PLAYER. 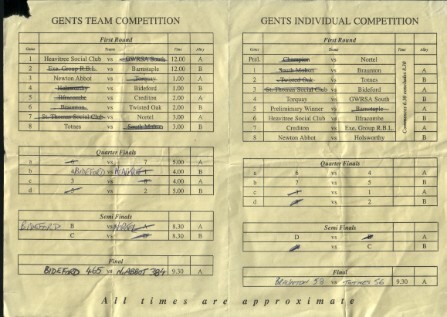 THE PICTURE BELOW SHOWS THE SCORECARD OF THE FINAL AGAINST NEWTON ABBOT. I THINK YOU COULD SAY THAT WE GAVE THEM A RIGHT GOOD THUMPING. THE THREE TEAMS WE BEAT ON THE WAY TO THE FINAL WERE HOLSWORTHY, HEAVITREE AND NORTEL FROM PAIGNTON. 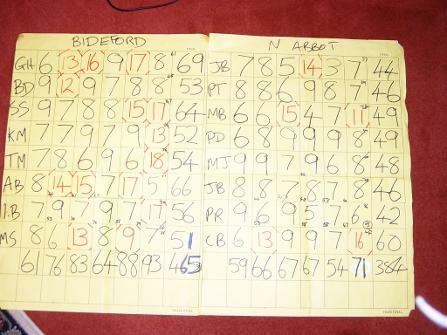 NEWTON ABBOT HAD BEATEN BARNSTAPLE BY 103 PINS IN THEIR SEMI-FINAL. 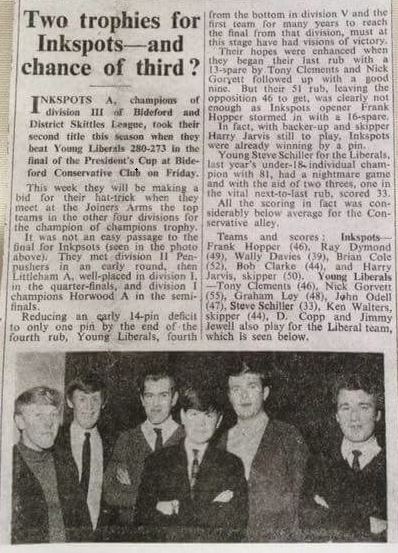 THIS WAS ONLY THE FOURTH TIME THAT BIDEFORD HAD BEEN COUNTY CHAMPIONS, THE LAST TIME BEING IN 1971.